Posted byFrédéric	 2018-02-28 2018-02-27 Leave a comment on The Winner takes it all in the Digital Capitalism – Good or Bad? 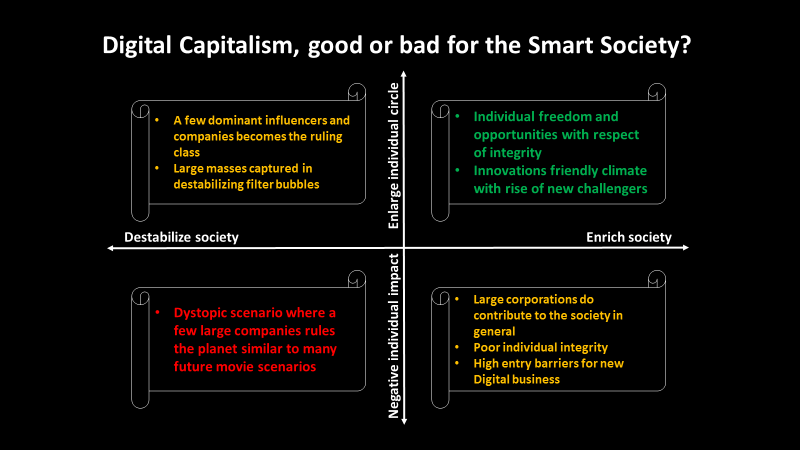 Already in 2009 Digital Capitalism (Networking the Global Market System – Dan Schiller – MIT Press, 1999) predicted the rise of a few US-based platform companies with scaring accuracy based upon an analysis of a number of structural aspects. The book is still very relevant and I thought it was a good start to reflect if Digital Capitalism is helping or not to create a Smarter Society. How good was the books prediction? A good blog with the label: FAMGA (Facebook, Apple, Microsoft, Google, Amazon) Is Eating The World and The Profound Implications of Five Increasingly Dominant Tech Companies, further deepens on the subject that we are in a “The winner takes it all situation”. So on this subject did Dan Schiller a good prediction. With the latest move in the US to potentially twist network neutrality this opens the door even further for the large corporation to make it more difficult for competing start-ups to emerge. So the risk for increased barriers for new digital companies to enter is quite likely. Some good thoughts about this could be read at The future of US net neutrality under Trump. Hence this is another area where Dan Schiller spotted where things where heading. All of the big us firms lately are racing to become the center of our home and life (Google Home, Amazons Echo, Apples Homepod, Microsoft’s Cortana, Facebook had M but has recently given up the race) with the ability to continuously monitor what we do and say, that does not feel particular attractive to me as an individual. If you want to read more about the risks Symantec has published a very good paper on the topic. The US-based firms are also key players in investing into AI. I have not found any solid source of data on how the spread of AI investments but several sources put the FAMGA in the top 10 of AI investments (US News, Investors.com, Investopedia, Techworld). Where except Baidu a couple of other US-based firms appears such as: IBM, NVIDIA and Netflix. So to sum it up there is a clear risk we are going to end up in the dystopian world of many futuristic movies where a few large (and typically evil) corporation rules the world with AI at their disposal. The Winner takes it all is over time not enriching for neither the society nor me as an individual as it only streamlines what we are offered. To balance above statement at least some evidence this companies, even if shareholder value are their long-term goal, that they from time to time voluntarily avoid the worst case scenarios. To mention a few concrete ones: Apple is usually trying to respect their users integrity (at least more than the others) and give them many settings on what to share and not, Facebook is lately trying to address filter bubbles and fake media, Google is offering their Google Docs to the use of many organisations and people at limited cost, Amazon is obsessed with Customer satisfaction and do trade of short-term profit. I just hope the sum of that takes us into the green quadrant of the chart below. The only thing I think Dan Schiller missed was the rise, partly behind the great Chines firewall, of the Asian digital companies. Cognizant published in 2015 an excellent paper called Asian Rising: Digital Driving with clear facts that Asia is fast becoming the center of digital innovation for the world. On the other hand, if you apply his structural approach, you will quickly come to realise that a very similar patterns to the one he discovered for the US-based firms, also is true for the Asian based companies, even if they have their own version of Digital (state controlled) capitalism. With a European perspective I see few real challenger in Europe to US-based companies dominance. To be honnest I am not sure it is better for neither me as an individual nor our society to become dominated by Asian based and often governmentally influenced companies as an alternative. The question is if there will emerge any counter balancing power, perhaps with some help from EU or local governments, to level the play field? At the same time we need to balance on the thin line between sub optimized protectionism and globalism with fair play. The business Europe, a European business federation are trying to drive the idea of the EU digital single market where EU has started to work on policy making. I think the most important thing would be legislation and platforms to give us as people back the ownership of our data and that we over time would start to create platforms where we can control and sell that data. So what to do tomorrow to prepare for the future? From a business end I would always plan to play ball with the big US-based corporations but try to also seek opportunities with the Asian challengers when you define your digital strategy. You need to at least consider how they could impact your market? As long as the big US companies or Asian challengers has not entered your market unfortunately the Winner takes it all rules in your niche as well. Either you are working at the Winning company or time to look for a job somewhere else. From an Individual perspective I am always cautious how much data I share with the US-based companies (or any company actually). And I am waiting until I can run my AI assistant before I’ll start to use them to any larger extent, especially at home. I appreciate all companies that build solution with my integrity in the center and use that as a key selection criteria for what to buy. Great if you want to drop a line of what you think or reflect after reading this article, that is quite motivating.